Super Smash Bros. Ultimate set to release in December. And since 'everybody is here,' Shacknews is taking some time to break down each of the game's characters individually, continuing with the king of the jungle, Donkey Kong. Super Smash Bros. Ultimate is the latest entry in Nintendo's ongoing premier platform fighter series. It's also slated to be the company's biggest release of the holiday season. After almost 20 years of battle between top characters of some of gaming's biggest franchises, Ultimate will bring together every single fighter from every Smash Bros. game to date (along with a few more) in one single game. With so many characters to choose from, Shacknews is taking a look at each and every one of the Super Smash Bros. Ultimate characters individually, leading up to the game's big release on December 7. Because many aspects of the game are subject to change, including character damage and special move properties, these profiles should not be considered final and can be updated at any time. Any guide that has been updated will be clearly marked. Today, we look back at one of the mainstays of the Super Smash Bros. roster..
As we take you through this monkey rap! He's the main monkey. He's the thrilla gorilla. He's the prime primate. He's one of the original Nintendo mascots, whose legacy dates back even before the original Nintendo Entertainment System. He started off life as a King Kong knockoff, tossing barrels at Jumpman and standing atop construction sites. Donkey Kong has since found fame as the leader of the Kong clan, defending Kong Island from all sorts of invaders, be they reptilian or otherwise. He's arguably outshined Mario at his own game, tackling the kinds of platforming stages that would make even the bravest of plumbers flinch. He also stands out as one of the most powerful members of the Super Smash Bros. roster, able to overpower all varieties of foes. Donkey Kong is one of the go-to fighters for anyone looking for a reliable heavyweight. 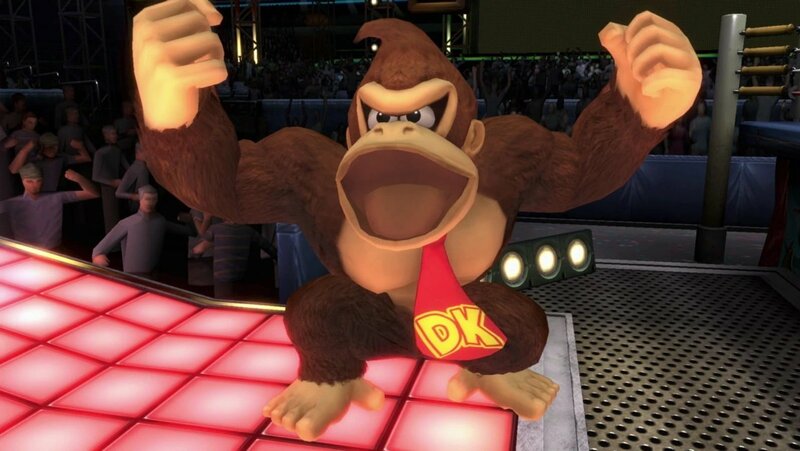 DK may not have the mobility that other members of the Smash Bros. roster enjoy, but he's fully capable of racking up KO percentages in the blink of an eye if anyone is clumsy enough to get within his grasp. 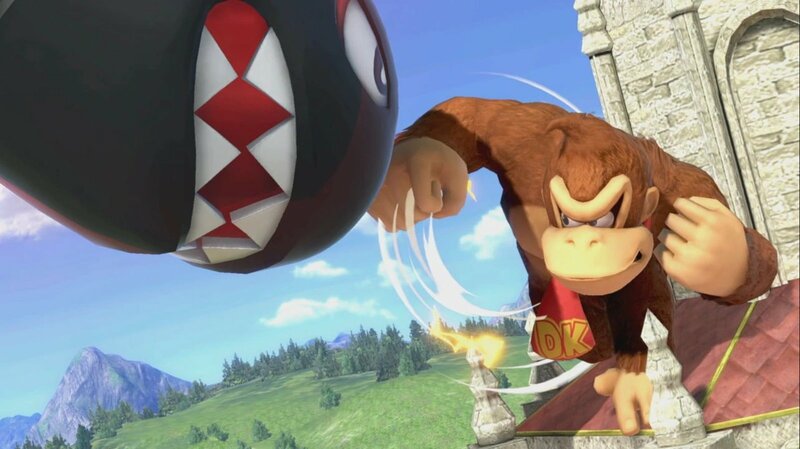 Giant Punch (Neutral B): It makes sense that DK's most reliable move involves his crushing fist. DK will windmill his punch, Popeye-style, to charge up a powerful punch. At ten spins, the punch will be fully charge and hit for massive damage. It can also be used in the air and the aerial version is noticeably improved. Spinning Kong (Up B): Donkey Kong spins around like a helicopter, damaging any targets in his path. It's a moderate recovery move, but gets terrible vertical distance. DK makes up for the lack of distance with better-than-normal attack range. Headbutt (Side B): This is a solid option for anyone looking to deal good damage without taking the time to charge up Giant Punch. Headbutt has a nice side effect where it will occasionally bury opponents in the ground temporarily. It's risky to use in mid-air, but if it hits just right, it will spike the opponent for an almost-certain KO. Hand Slap (Down B): DK slaps the ground and knocks anyone caught in range off-balance. The Hand Slap can also cause moderate damage, but it won't KO. This is more of a setup move and can be followed up with harder-hitting moves or combos. 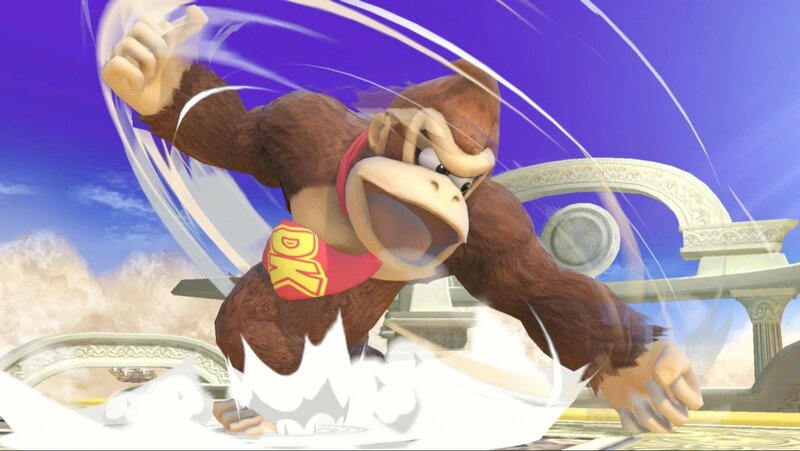 DK Punch Barrage (Final Smash): Donkey Kong's old Final Smash has been retired in favor of this punch flurry that should look familiar to anyone who has played the newer-generation Donkey Kong Country games. Just as he punches out any bosses that dare invade Kong Island, so too will DK punch out anyone caught in this Final Smash's range. Outside of his Final Smash, Donkey Kong's moves are largely unchanged from previous Smash Bros. games. But these moves have all gone some significant changes, for better or worse. First off, there's Giant Punch, which still causes massive damage. That damage now comes at a cost, as the move's ending lag has increased noticeably, leaving DK more vulnerable if he misses. But with that said, the lag on the aerial version of the move has been heavily reduced, making it a more viable offensive option. Those looking for a quicker strike can still opt for Headbutt, which is also improved. The Nintendo Treehouse stream during E3 noted that Headbutt now comes with super armor, making it one of DK's best and safest offensive options. Spinning Kong now travels at a totally different angle. The move now gets less horizontal distance, though it now travels a bit higher. The change is angle ultimately makes the move worse as a recovery option, which means DK players will have to work harder to make sure they don't get knocked off the platform. The trade-off is that Spinning Kong is now better as an offensive option, thanks to a new final blow that deals moderate damage and decent knockback distance. Lastly, there's Hand Slap, which is mostly unchanged. However, both versions of the move (grounded and aerial) can now be canceled in mid-move, giving DK a little more mobility. There have been few players who have identified as Donkey Kong mains. However, Donkey Kong has proven to be a reliable backup option for many players. One of the most recognizable examples is Gavin "Tweek" Dempsey, who turns to DK for certain matchups, but he's keeping his notes close to his chest for the moment. Larry "LarryLurr" Holland is another top player with a reliable pocket DK. He has weighed in on his thoughts on the character. In particular, Larry raves about the aerial version of Hand Slap, which is much faster and auto-cancels upon landing, going so far as to call it the biggest buff the character has received so far. Look out for DK's forward-air, which is also noticeably more powerful and can KO earlier. Larry also took his DK out for a spin personally, taking on Ramin "Mr. R" Delshad. But it isn't all buffs and improvements for Donkey Kong, because certain changes to Ultimate mechanics as a whole may not favor him so much. Top Donkey Kong main Michael "DKwill" Walsh has made this observation. What this means for DK is that we might need to find something other than f-smash or punch to follow up. Either that or you can start charging punch if they're in the corner, then try to react to their option. Lastly, here's a look at some DK gameplay from Tyrell "NAKAT" Coleman, as he gets accustomed to the new-look gorilla. And with D'Ron "D1" Maingrette on the other side, this video will have some top-notch commentary. Super Smash Bros. Ultimate is set to arrive in December on Nintendo Switch. For even more information concerning Nintendo's latest brawling release, be sure to head over to Shacknews' Super Smash Bros. Ultimate walkthrough and guide.